The menu at the Dial House in Reepham’s Market Place, which has recently been taken over, is being tweaked by the new owners and is expected to be finalised by the end of May. 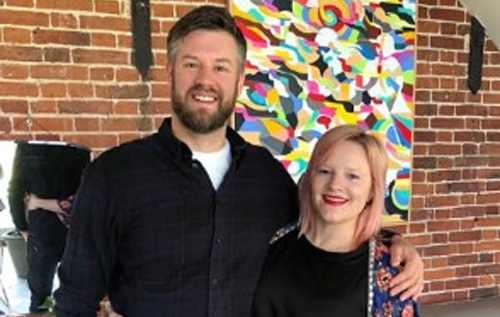 Local couple Andrew Jones and Hannah Springham (pictured), who run Farmyard Restaurant in Norwich, acquired the Georgian building and the Dial House business with its boutique hotel and restaurant on 30 April. 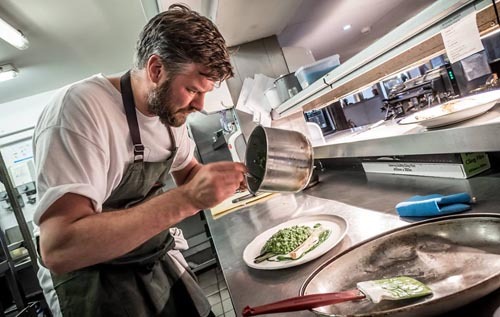 Mr Jones will oversee both the Dial House and Farmyard operations as executive chef, focusing on menu development, sourcing, staff training and mentoring. He expects to spend most of his time at the Dial House over the next few months, eventually splitting his activities evenly across both businesses, which will be run alongside each other. The couple are keen to stress that the Dial House will not be another Farmyard. “We won’t be going in and scrapping everything,” said Ms Springham. “The service is great, the site looks fantastic, but we’ll be cranking up the food offering to bring it in line with what already works so well. The menu will be slightly more refined and elegant to fit in with the Georgian surroundings and will include classic dishes that reflect the British Empire theme of the rooms, with local sourcing of ingredients wherever possible. He added that a head chef was appointed at Farmyard in December and there are no plans to roll out the Farmyard brand: the Dial House will be a different proposition to Farmyard, and the aim is to develop a group of businesses. All space in the Grade II-listed Dial House building is currently utilised, including the Country Salon hairdressers and the Green Room women’s clothing boutique, but there could be opportunities for freelancers or pop-up events. In particular the Objects interiors concept, where antiques, curios and objects of interest – and all the furniture – are for sale, is being retained with this business continuing to be run by Sarah Tribe. As operations director across both sites, Ms Springham’s role includes branding and marketing. She will also launch Marigold Events at the Dial House to deliver bespoke private parties, business meetings, corporate events and weddings. Andrew Jones will be demonstrating food tips and recipe ideas on the Woodforde’s Cookery Stage at 12.30 pm during the Reepham Food Festival on Sunday 27 May.